This is a stranger creative journey than ever I would have predicted… Held close within my memory, I can still see and feel and smell a world where I couldn’t feel what was wrong and then it felt like something was really, really wrong as soon as my body started to fight it’s way back into the world of the living. Images. Faces. Like snapshots, I am tracing these vivid little tidbits onto paper. 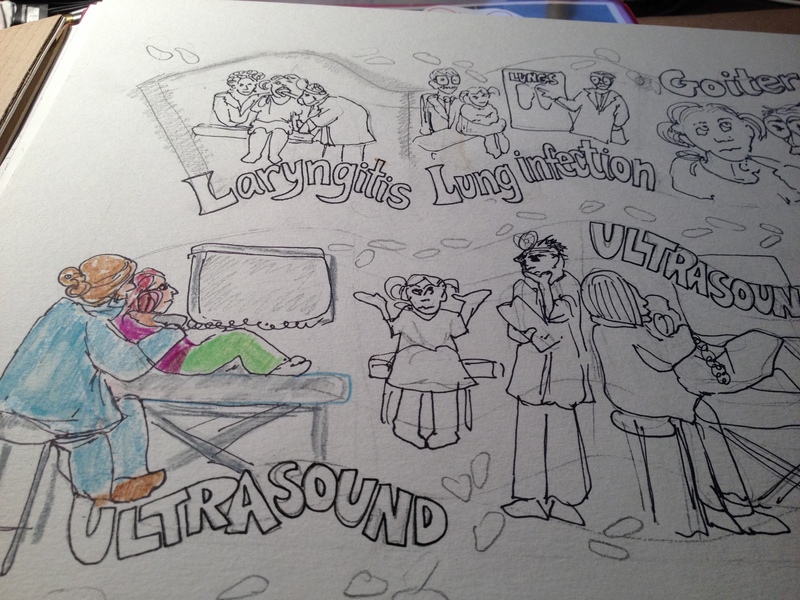 I had this crazy creative kick, while recovering from surgery. My brilliant Momma brought a sketchbook to my room and left it with me… so I could try and record my thoughts or doodle if I got bored. And that, boys and girls, was the beginning of my journey: MY SUPERHERO SURIVAL GUIDE. Somewhere between my surgery and my radioactive iodine ablation and my external beam radiation, I came up with a plan. After waking up without part of my voice, I was terrifically depressed and saddened by the loss of what the future had always been for me. I was going to be a successful actor and entertainer… and now? I couldn’t carry on much of a conversation for long. I knew that I had to find some way of sharing a story I knew all to well. It’s a good one. When I say superhero, most people quickly dismiss it as fantasy. They can’t see any reason to use a fictional super powerful being to tell a story that’s all too human. We made superheroes for a reason… it’s not about distinguishing the strong and powerful that is not naturally human. Captain America happened when President Kennedy was shot. Bruce Wayne had a traumatic experience in his childhood. The Green Arrow came back from being presumed dead and he promised to clean up his city and make his world a better place. The superheroes I am talking to are just like you and me– we’re not from Krypton or some other far-removed planet. Just look at who they’re being and see for yourself: the qualities that make a super hero are inherently human traits. All it takes is a shift in perception to see that we are all superheroes– we just have to get off our butts and act like it!! Be generous and you will live forever in the hearts and minds of everyone you touch! I had already come to this revelation before the cancer bug bit me. Proclaiming myself to the world as a superhero would be no small feat. So I adopted a more undercover approach to saving the world. Then… life got in the way and I spent the better part of three months thinking about death and how not to die and what had I done to deserve this etc. etc. etc. (The usual stuff that pops up when someone tells you that you have a serious, life-threatening disease. As soon as they say Cancer, you think ” Does that I mean I’m going to die?” and it’s not your fault: it’s natural and it happens to all of us that way..
After I woke up from surgery? Like crap… I felt different and sore and I was really thirsty all the time. It felt like someone had turned the inside of my mouth into a blow up doll. It was all puffy and it felt deep and squishy. I’m not sure if it was me or the meds but I spent a good while exploring all this new terrain with tongue. I couldn’t feel most of it. So I was trying to trace it into my memory with every twist and turn my tongue could take. Swallowing was no fun either. It felt like something was holding onto my neck really tight but when I tried to touch my skin, I couldn’t feel anything. My ears on moth sides were numb ( no fun trying to put earrings in when you can’t feel pointy.) I had six drains and my iv and the next day: they discovered that I needed to be fed through my nose with an NG tube– the least comfortable thing I have ever had to allow someone to shove up my nose and down my throat. Nasty! Apparently, they’d nicked my thoracic duct, so they were feeding my in such a way that it would heal properly. For five days, they fed me pink goop from a bag that hung next to my iv drip. I’ve been revisiting these memories periodically. First as a coping mechanism in the hospital, but later? My sketches took on a life of their own and now I am sketching my feelings and experiences and the insight/lessons I have gained from my experience with Cancer. 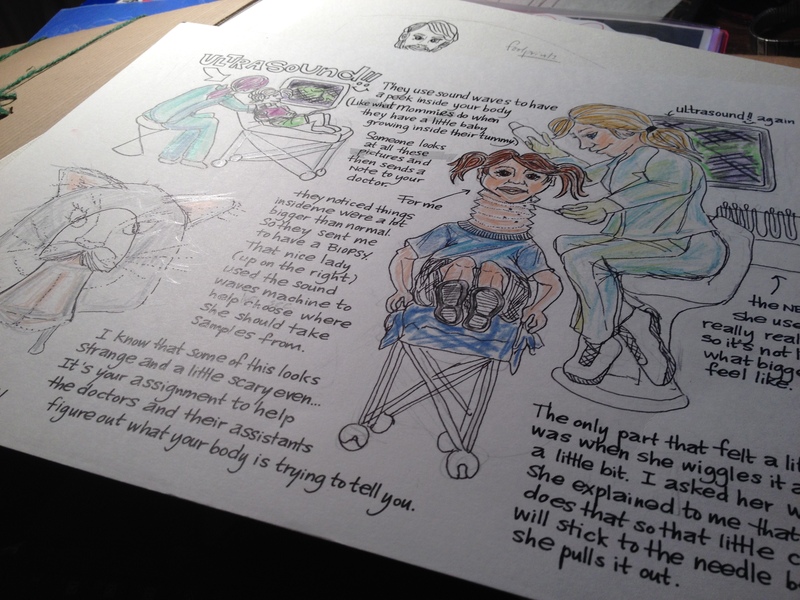 I find a delightful freedom in telling my story through cartoon-like narratives and sketches. 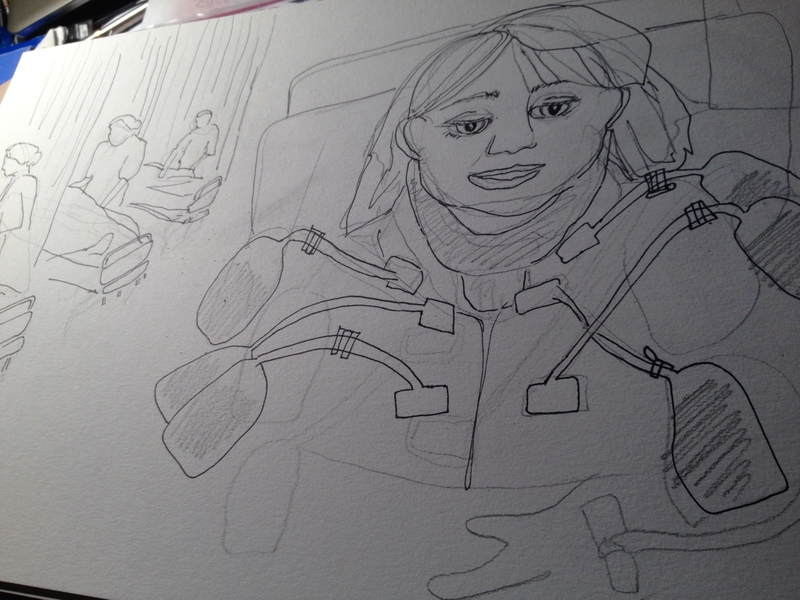 Partly, because that’s how it all started for me in the hospital; but also because of the ease it brings to my depicting some of the trickiest stuff that I have ever had to deal with first-hand. I’ve created a character for myself. She is a younger Cancer patient whose experience is loosely based on what I did and said and felt. Her name is Sam and she’s a creative spitfire of a superhero. Sam is determined and perceptive and she always likes to figure things out– great qualities for any superhero fighting cancer to have! 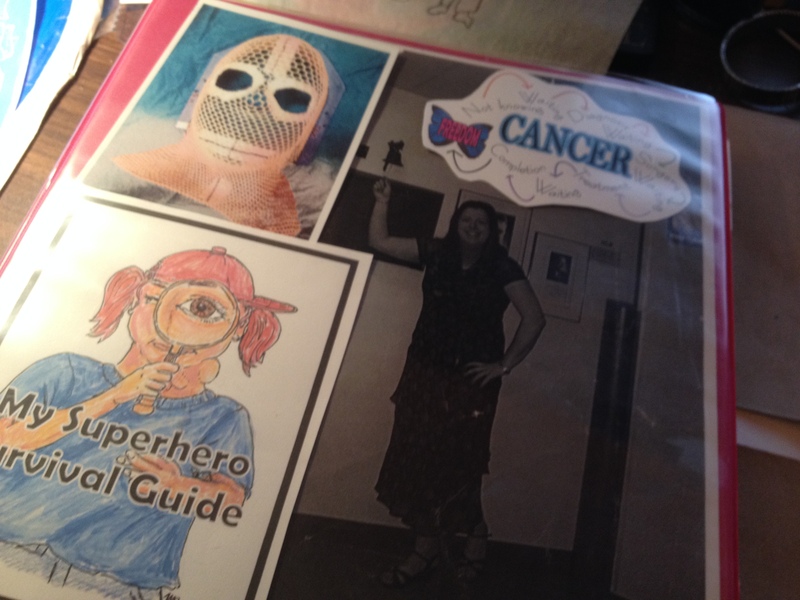 Seeing the world of Cancer– it’s treatment, diagnosis, and survival– through the eyes of a child has given me a little creative license to add details or take some out. In the end, it’s not so far from the experience most Cancer survivors share. We go from being relatively normal people with ordinary lives to being reduced to a childlike state of living, i.e., being taken care of, having help getting dressed or being given our food and medicine etc. It can be a bit of a crazy-maker but we all just need to accept that it’s part of our journey to wellness. Be thankful that we have such amazing support from all around, boys and girls. Even when they don’t full understand what you’re going through: love always finds a way to make you feel better. Figuring out how to tell my story without too many words has been a challenge but I’m keeping it real. A lot of people have said a lot of stuff about Cancer and they’ve shared their experiences in interview format or in books or blogs or on the web in other ways. Both of these books have impacted and inspired me on my journey. I must admit that David Small’s depictions struck such a chord with me that it brought me to tears. So now I am back on my journey and with each new page that I create: I make mental notes and stick post it notes on the picture as I try to remember all the faces and places and feelings that I sometimes wish weren’t so,,, then I wake up and remind myself that it’s a bright new day and that the only way that I will make sense of my brave new world is by sharing the secrets of my success with children and adults alike. You have everything you need down deep inside to help you get through this awful mess!! Trust the doctors because they know what they’re doing… Trust your heart to help you feel everything you need to feel to get better… and learn to Trust yourself. In the end, we– none of us– know exactly where we need to go to get there… Figuring it out as you go and reminding yourself every day– why am I doing this– will carry you through the storm. Letting go of the notion that somebody might steal my story I will bravely share with you what the bleep I’m doing about this great idea I was someday going to get around to doing– someday is happening right now!! I’ve rung that bell also..I see these are old posts – I hope I find you somewhere else making current posts…. Great post here!